The thyroid is a gland that regulates your metabolism and can be affected by many conditions. These include, but are not limited to, nutritional deficiencies, pregnancy and menopause. Thyroid problems can also be caused by medications you are taking, or may simply be genetic and/or part of an underlying condition. Thyroid function is important to your hair as it helps to control the production of proteins and also your body’s use of oxygen. Having either a hypothyroid (low) or a hyperthyroid (high) can cause hair loss, hair thinning or reduced hair growth, and when severe, hypothyroid causes hair loss in up to 50% of cases. Both hypo- and hyper-thyroid are easily diagnosed by low or high thyroid test readings. However, readings just within the normal range (such as high-normals and low-normals) should also be looked at if you are experiencing hair loss. 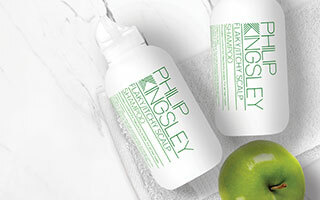 Please consult with both your doctor and a Philip Kingsley trichologist if you are concerned. Two common thyroid diseases are Hashimoto’s (hypo) and Grave’s (hyper). 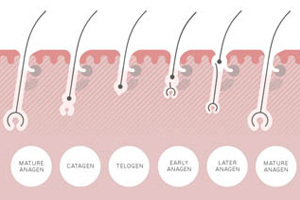 Hair loss is just one of the symptoms of these and you would expect to experience one or more of the others listed below. If you begin to notice any of these symptoms, we suggest you consult with your doctor. We suggest you make an appointment to see your doctor and/or endocrinologist if you suspect you have hyper- or hypothyroid, as well as consulting a Philip Kingsley trichologist. There are many medications that treat thyroid disorders, but they are prescription only. Once your thyroid is being treated by your doctor, there are specialised, hand-made hair products we can prescribe to help promote regrowth and combat hair loss. We will also be able to consult with your other specialists in order to establish the best treatment route for both your body and your hair.